Did a diamond fall out of your ring? If you need help to fix that, you also need a quick talk on how to prevent that before you lose the priceless stone. We’ve got 20+ tips to help you on ways to prevent Losing Diamonds from Engagement Ring. Did a diamond fall off your Engagement Ring? Checking your diamond is not enough when you just lost your $8,000 diamond on your $10,000 ring. All the regrets in Macbeth won’t settle for the loss. So, find the right ways to make sure your priceless diamond is safe just as your precious wedding ring by consulting the answers below. Is it good to sleep with your engagement ring on? Most diamond pros will advise against sleeping with your engagement ring on unless it is a metal band without stones. From physical injury to bruising your partner or your $2000 Tempurpedic mattress. Let’s cite a few knowledgeable sources for you. According to Richard (Gerald Peters)“It’s easy when you’re asleep for your ring to get caught in things such as your hair or on your sheets and this can cause the stone to loosen in the setting”. According to Brilliant Earth(Brides Quote), “Putting your body weight on your hands in this way can slowly put pressure on the ring and cause it to lose shape, risking accent stone loss”. Causes of Loose Diamonds in Engagement Rings? Why do you lose diamonds from engagement ring? Is there a lifestyle change to save my diamond from losing? How to prevent losing stones from a wedding ring? Get your questions answered now! If your diamond engagement ring is set with poor prongs or wrong setting, it can lead to losing diamonds in the future. You must always consult a professional jeweler or reviews we have on DPA to choose the right setting for your diamond shape for long-term use. Diamond is the hardest substance on Earth; but, a strong blow to the cleavage can split or chip it. Depending on the inclusion in the diamond of your engagement ring, it can break depending on thrusts and blows. If diamond on your ring fell out, PLEASE don’t try to glue it back. This is because unlike most things, diamond is very finely polished. This means it has zero to no pores for the glue to stick on to. Diamonds age just as you, the car or earth itself, from where it was born. IF the diamond was already loose in the prongs, it will oscillate and roll to depreciate over time. If you’re into the habit of handling harsh chemicals and we’re not skipping cosmetics, you need to think twice. These chemicals create dents and flaws on the metal and stone such that it degrades. From prong problems to diamond looseness, you can lose your precious rock in no time if you’re not careful with the engagement ring. Ways to Avoid Losing your Diamonds from Engagement Ring? 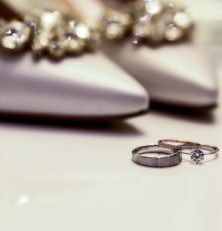 How to protect your diamonds on the wedding ring from falling out? Stop wondering and start using the smartest tricks in the book to keep your diamonds safe in the engagement rings. We’ve all been there when the precious stone falls out of your even more precious wedding ring. Don’t let it happen to you again. Take wise steps to know the causes and solutions to avoid losing your diamond from engagement rings right NOW! Make a schedule for checking your diamonds by a professional jeweler under magnification. The best way to avoid aging of diamonds? Get regular maintenance on your diamond rings because most jewelers don’t even charge for that! One of the best ways to ensure your diamond is not loose in the ring is by periodically cleaning it. You will inspect the tightness of the stones as well as fix it, if anything is awry, in such a case. If you’ve a habit of taking off your engagement rings before sleep, it is always best to havering holders at your disposal. This will prevent you from keeping it on surfaces that scratch the metal or stone of the ring. Periodically resizing your diamond engagement ring can also prevent losing your diamond from the ring. This way, the jeweler periodically examines your ring professional to ensure all the prongs are tight and the stone is secure. If you know that the diamond is loose in the wedding ring, the first step is to safely take the ring off. Next, keep it on your jewelry box. After that, get it fixed right away before you take it for a spin. As a rule of thumb, remove your engagement ring made of the diamond when in Doubt. Still wondering what to do? We have a thriving diamond users community, so hit us up with a comment below and we’ll help you right out!